In my first week of college I went to a concert at the Knitting Factory, where I heard a kid in the crowd talking loudly about being a freshman at NYU. I nearly ran across the mosh pit to meet him. Eric Ng was my first friend in New York. 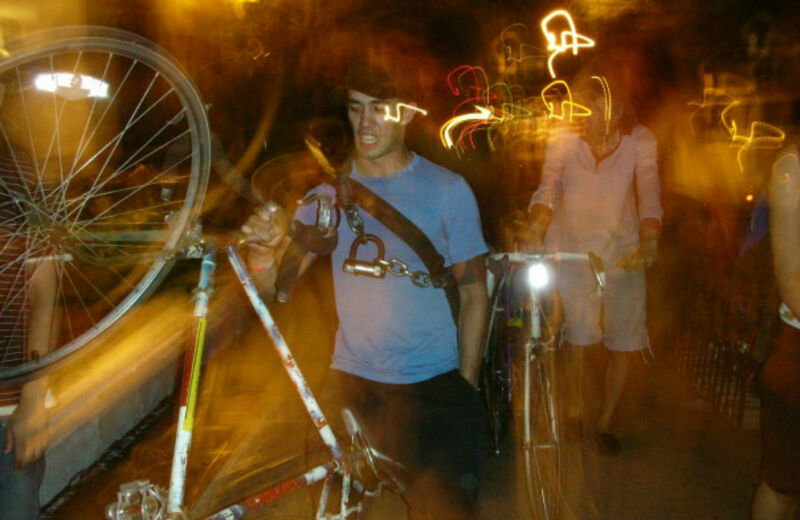 In 2006, six months after graduating from college, Eric was riding his bike down the West Side Highway bike path. He was in his fourth month of the New York City Teaching Fellows program and he was thoroughly appreciating his Friday night. At the same time, a white BMW packed with five people left a party at Chelsea Piers and headed downtown, only it wasn’t driving on the highway—it was driving on the bike path. Near the intersection of Clarkson Street, the car hit Eric. His bike and shoe flew into the street, and he was killed on impact. Some of the people pinning flowers to the "ghost bike" knew Eric well. But some had met him once, and some never at all. After the "ghost bike" ceremony everyone went to St. Mark's Church, a left-wing landmark in the East Village, where activist legend Reverend Billy (of the make-believe Church of Stop Shopping) preached about the importance of youthful energy, which he had heard Eric had in buckets. After the event at St. Mark's, a massive party was held at the two-floored Times Up! bike collective space on Houston Street. It was a wild time: three DJs, twenty-somethings dancing ‘til they could no longer stand, people kissing who hadn’t spoken in years, alcohol consumed by the barrel. Someone stood up at the microphone and sang, impromptu, whatever she imagined Eric’s favorite songs were. Eric was dead, and people were really getting down. Maybe there was something beautiful about it, all of this grief let out in a joyful swirl. But was it grief? Many of the people there were just bicycle advocates. Was this memorial someone’s protest? Was this protest also a party? Standing in the back of the room, drinks in both hands, I felt sick. In the past several years I’ve had conflicting emotions about that party. Is it OK to paint a bicycle white, like a parody of a ghost? Is it a good idea to congregate at the exact spot where a human being’s life ended violently? The celebration might have been full of love and rage, and a reflection of the community that Eric was a part of—but was it right? These days I often walk a block out of my way to avoid seeing a "ghost bike" on the street. But ultimately, I’m glad that Eric’s memorial bike is still standing. And he would be too. The last time I saw Eric was when we went to my brother-in-law’s punk show in Bushwick, Brooklyn. No one else would come with me. As we huddled in the corner of the crowd, together, Eric joked, “I don’t want to be here either, I’m just a sucker.” All I did was punch his shoulder. In January Mayor de Blasio announced that reducing traffic related deaths would be a priority in his administration. Perhaps now is a good time for a greater population to remember Eric Ng and those people who make us feel less alone in the world. Perhaps now’s the time to honor Eric’s life and the work he would have done, by trying to prevent more searing white bicycles from being installed on our streets. Maura RooseveltMaura Roosevelt is a language lecturer at New York University, where she teaches essay writing.